Pasture or grazing management is a science and technique that dairy farmers can use to produce high-quality forage while keeping milk production costs low. Learning how to effectively manage pastures involves understanding how pasture plants grow, and how dairy cows use them to produce milk. Cows grazing. Photo credit: Amanda Gervais, University of Vermont. It is natural for a grass plant to grow rapidly in the spring and produce seed in early summer. However, as plants mature and begin to form seed, the content and digestibility of nutrients and intake potential decreases. Therefore, managing pastures so they remain in leafy, vegetative growth is ideal for optimum animal performance. 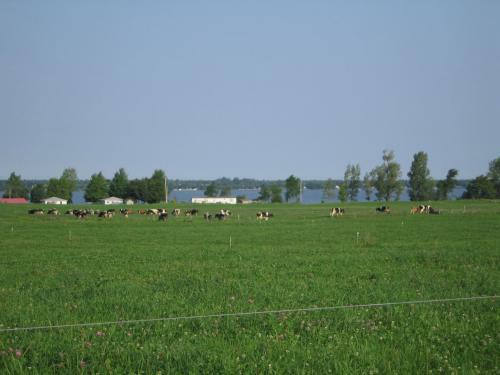 For more information, see Pasture Plant Growth and Development on Organic Dairy Farms. Improved grazing management that keeps pasture plants in the vegetative stage will help you get the most from pasture and animal productivity. Concentrated feed costs are lower in a balanced diet utilizing abundant, high-quality pasture as a major source of forage.